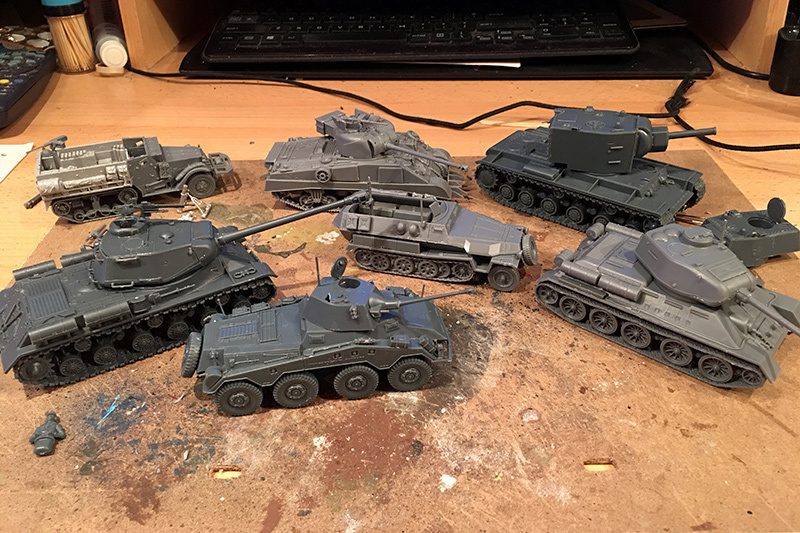 I started building these bad boys a couple or more months ago but kind of got sidetracked before completing them. 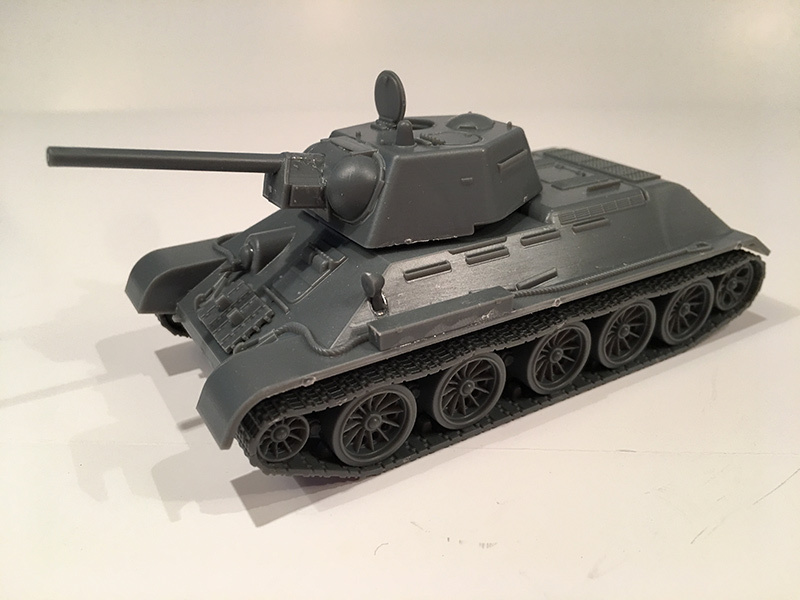 I got two versions of the T-34, 76 and 85 plus a KV-1/2 and an IS-2, all made by Warlord Games. 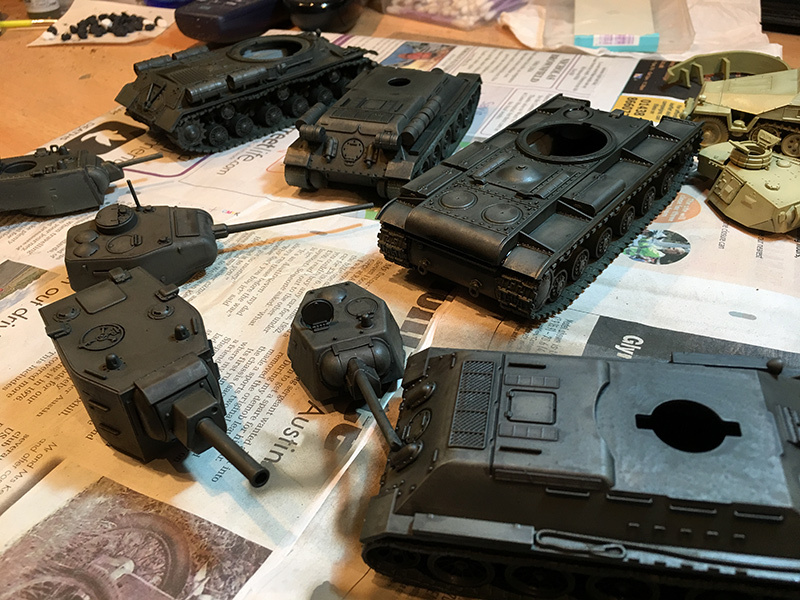 I managed to build them all over a couple of days and got a couple of coats of green on them using my new airbrush. 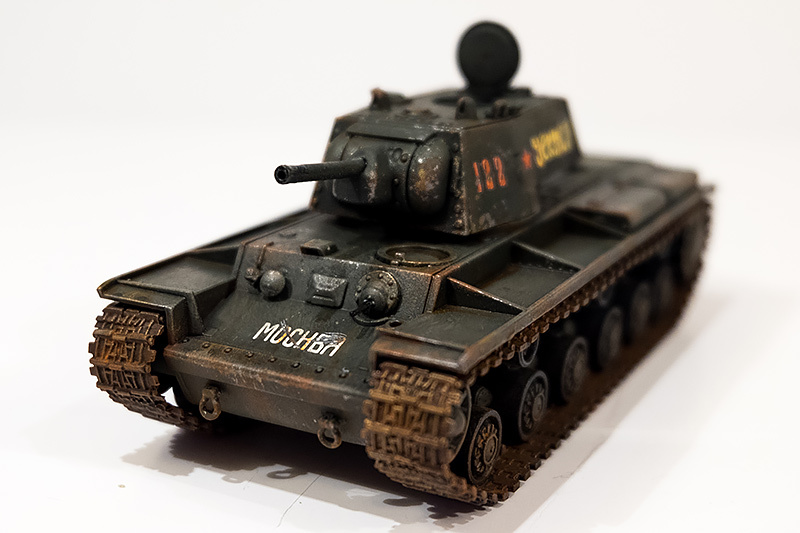 This was followed by a couple of coats of lighter green to give it some shading, then a coat of black ink to pick out the details in the modelling. 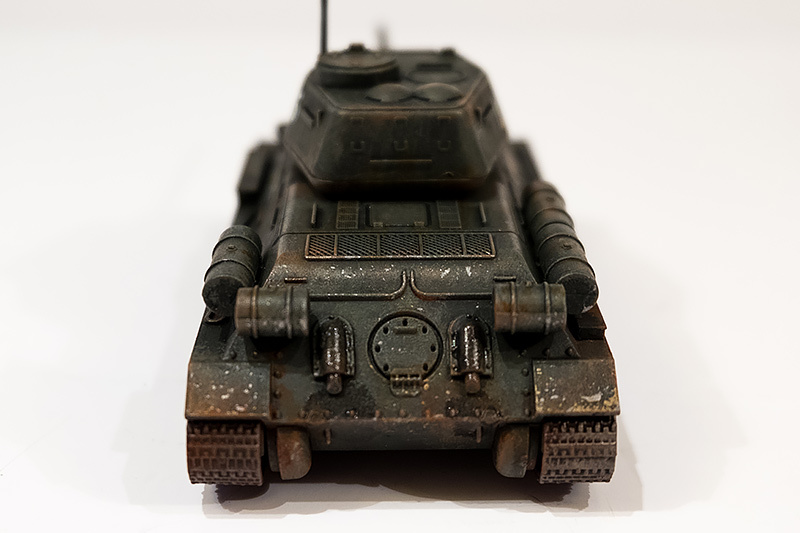 The decals are the standard ones which come with the kit, which means there isn’t a great deal of choice as all the decal sheets are the same for each kit. 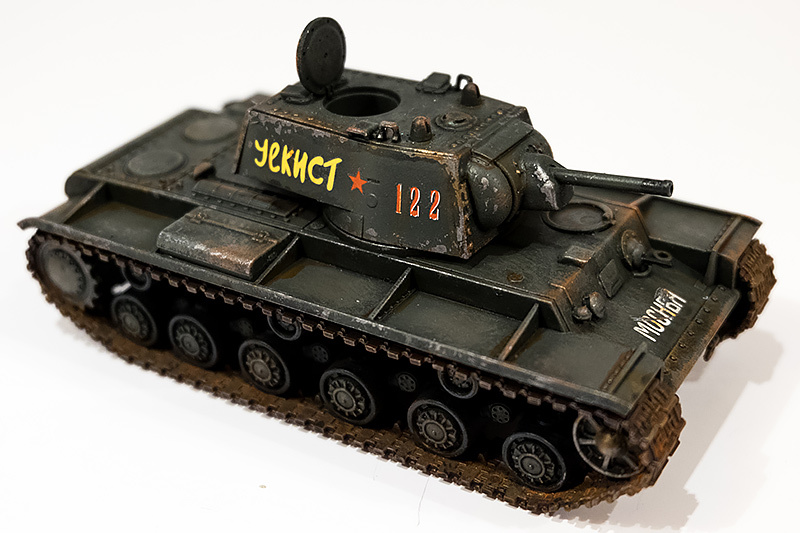 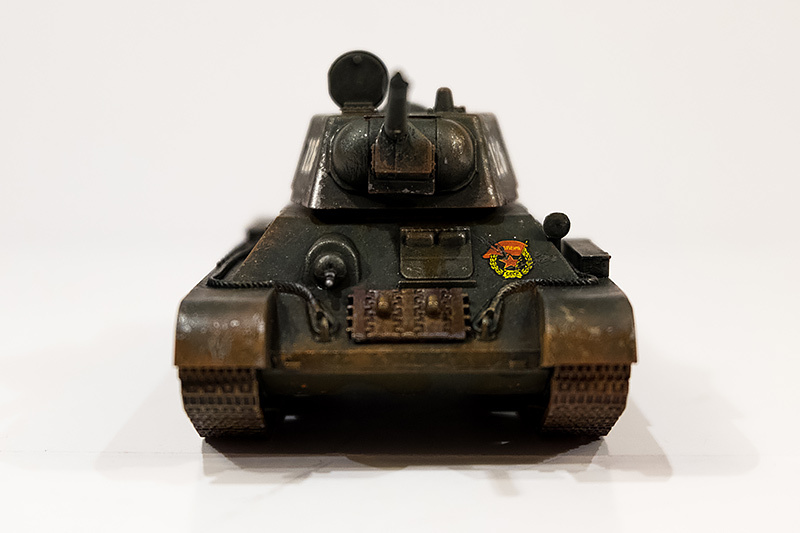 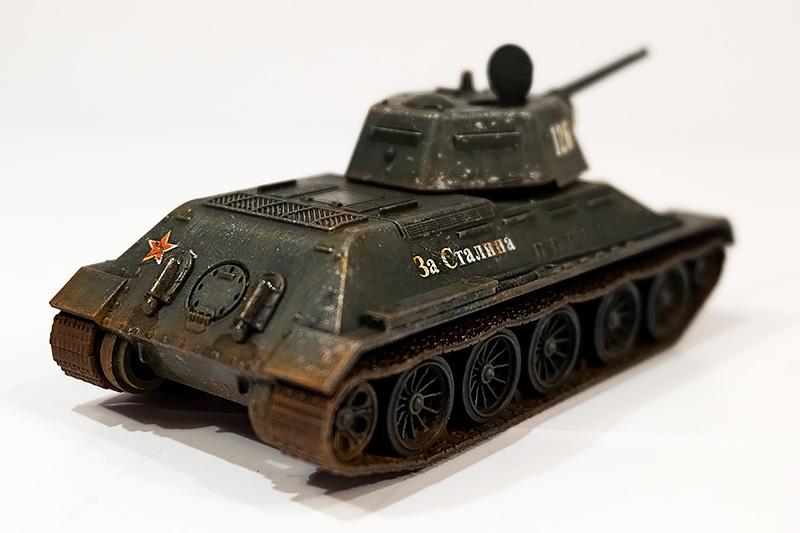 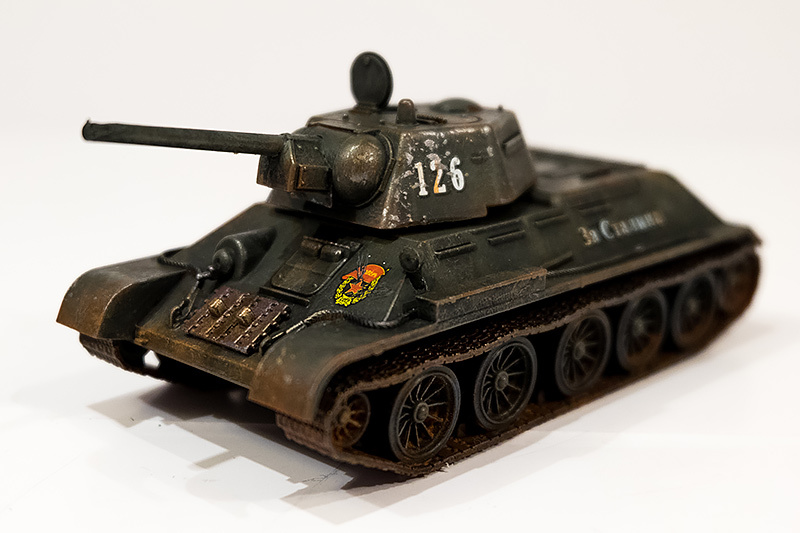 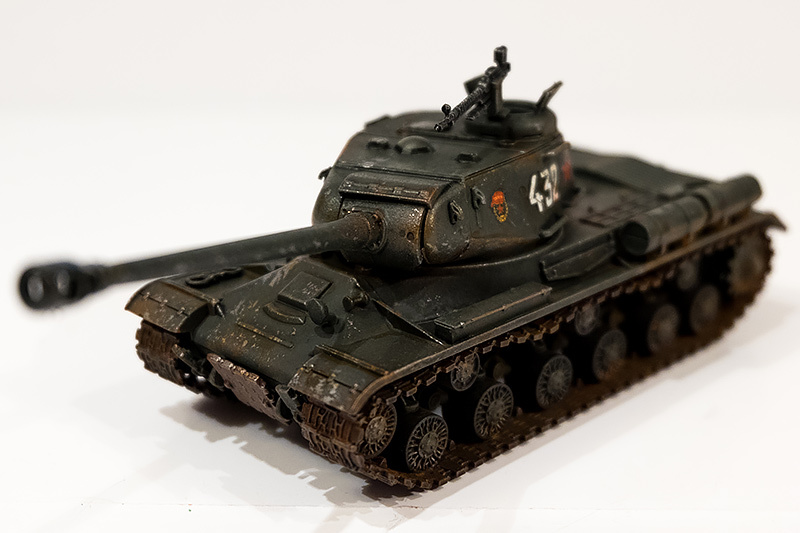 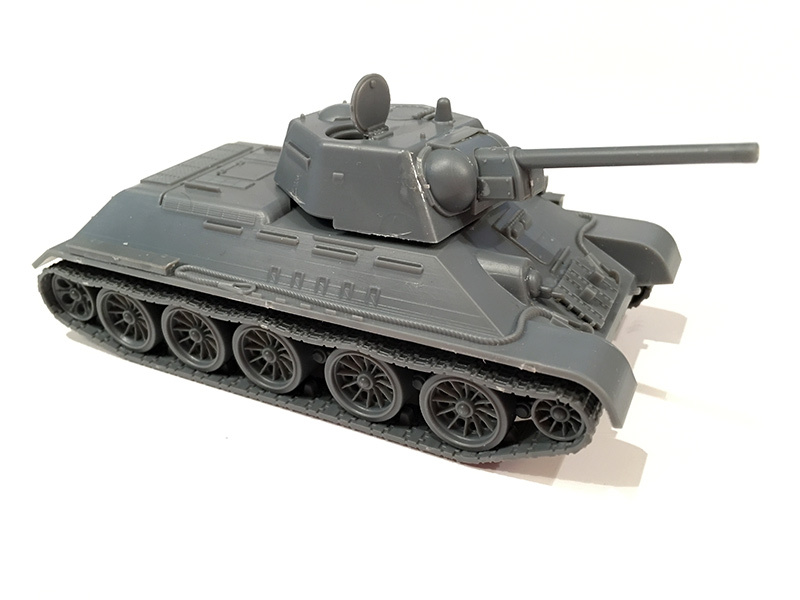 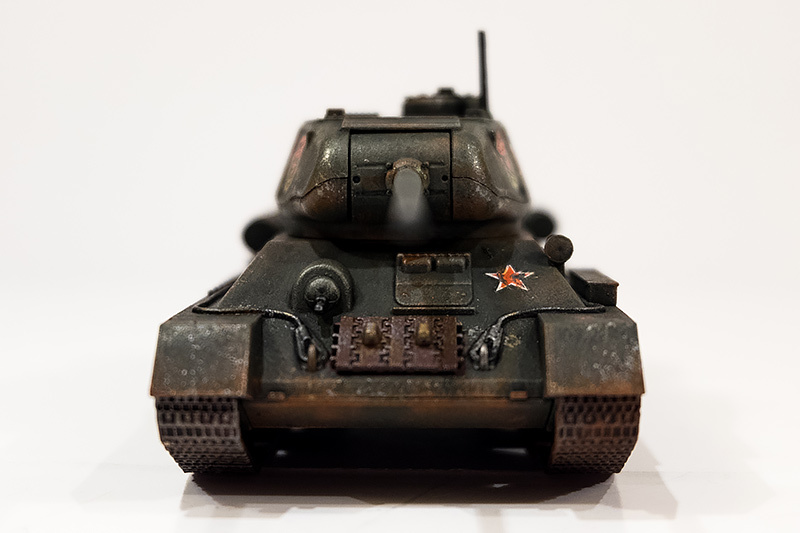 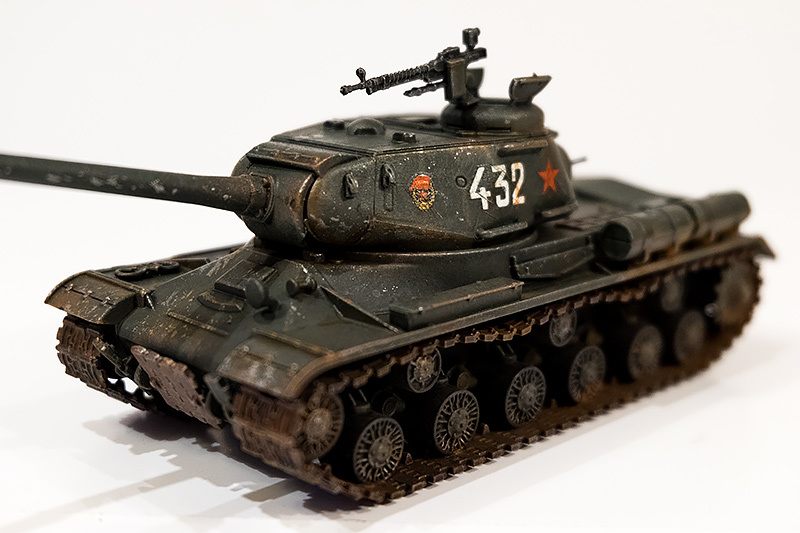 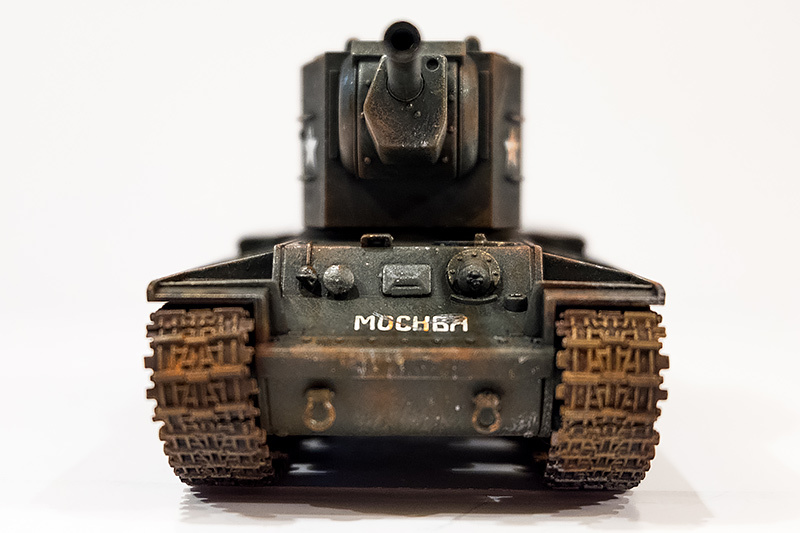 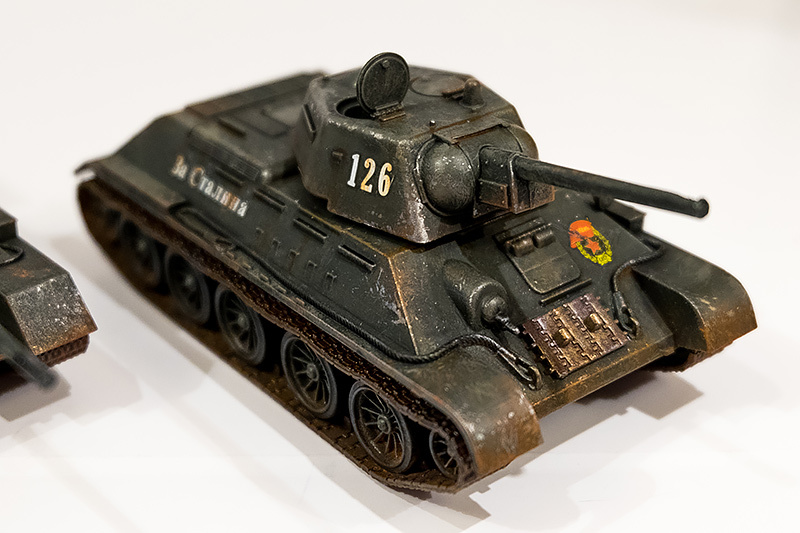 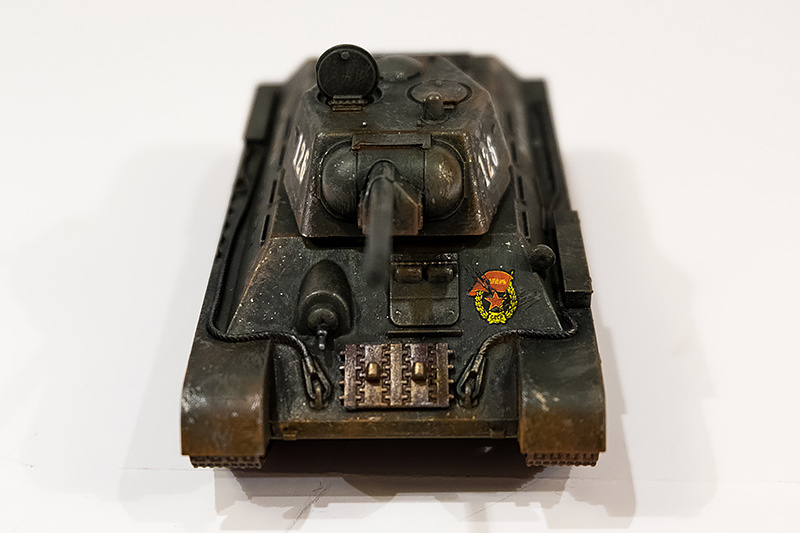 The T-34/85 has a turret unlike most of the other kits; they have turrets with lugs on so you can match the lugs up with cut-outs in the hull, fit the turret and you can then move the turret around without it coming off. 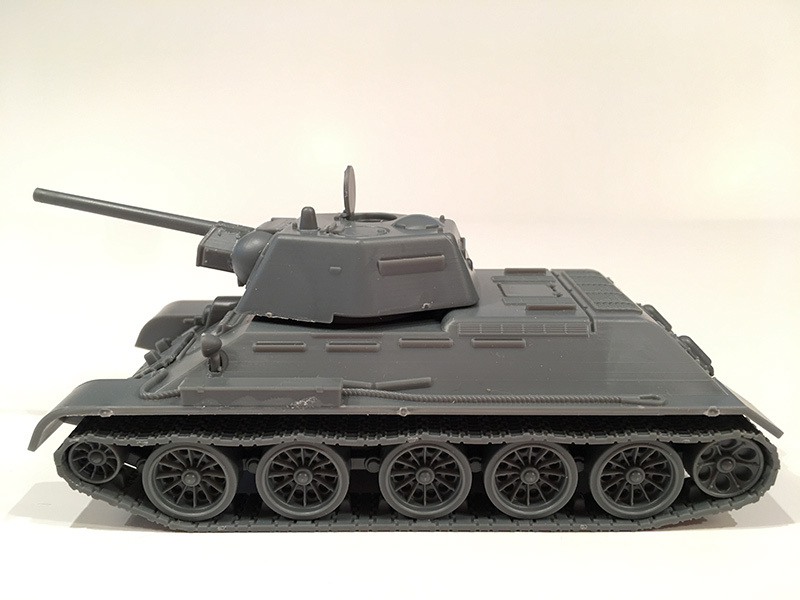 The T-34/85 doesn’t have those lugs on the turret which means once the turret is fitted, you can revolve it but you can;t take it off. 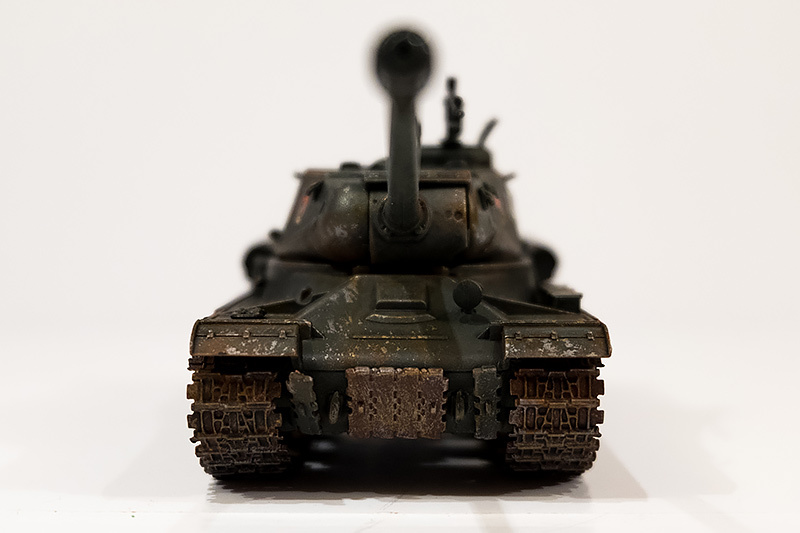 This becomes problematic of you want to denote a knocked out tank by the removal of a turret. 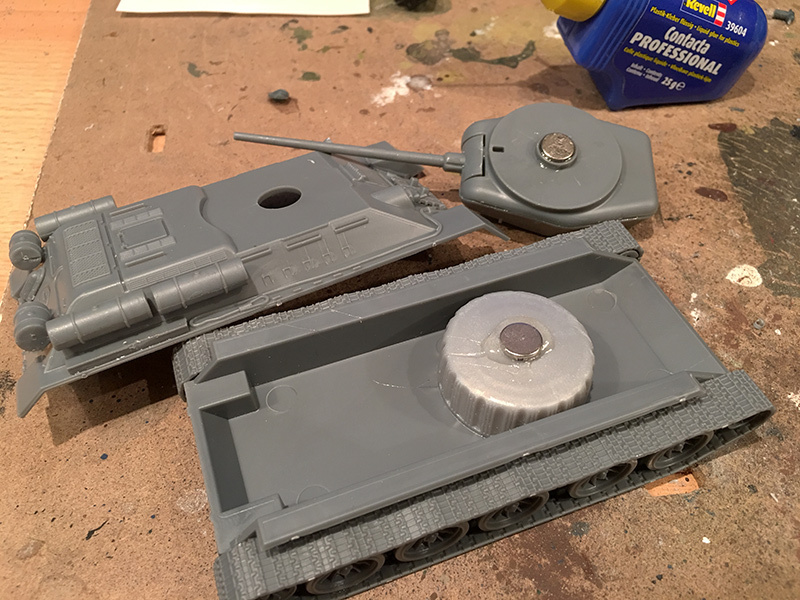 So I had to cobble together an alternative arrangement involving sticking a magnet in the hull on top of a bottle top and then putting another magnet on the bottom of the turret. 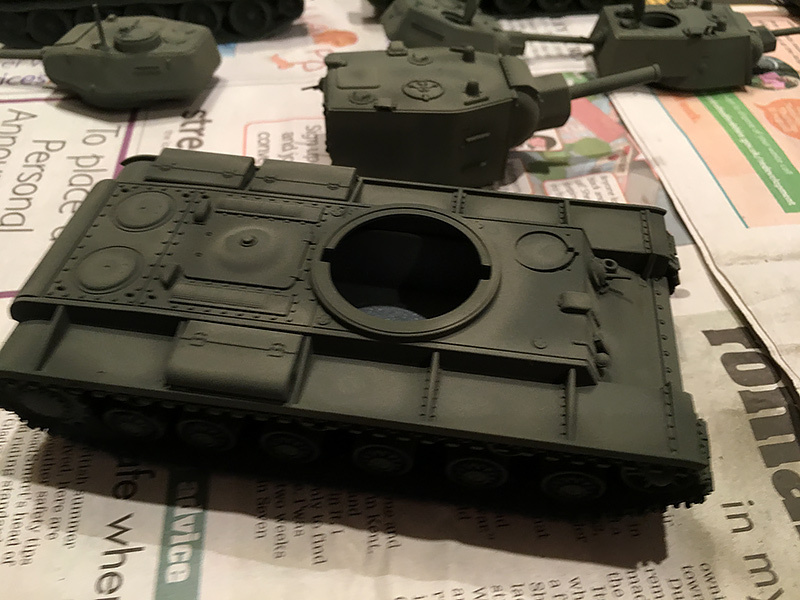 Now I can swivel the turret and remove it. 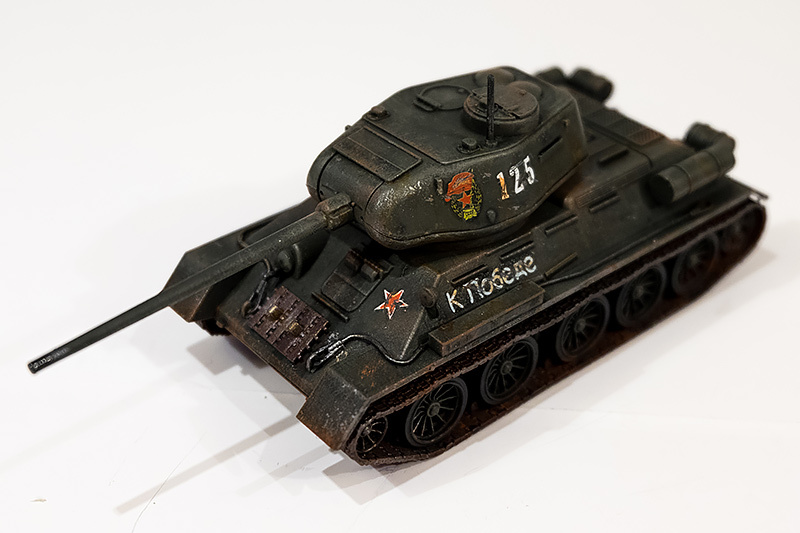 So fast forward a couple of months (while I have been collecting and building some Romans) and I finished the Russian armour with the weathering process. 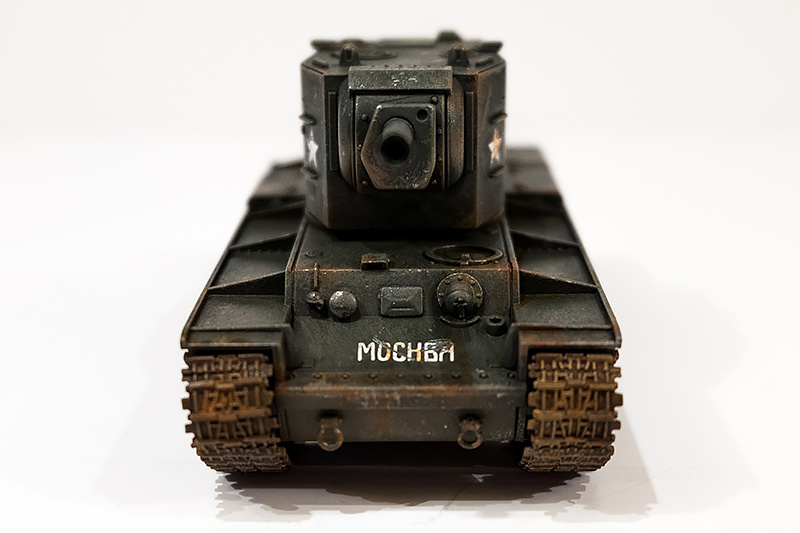 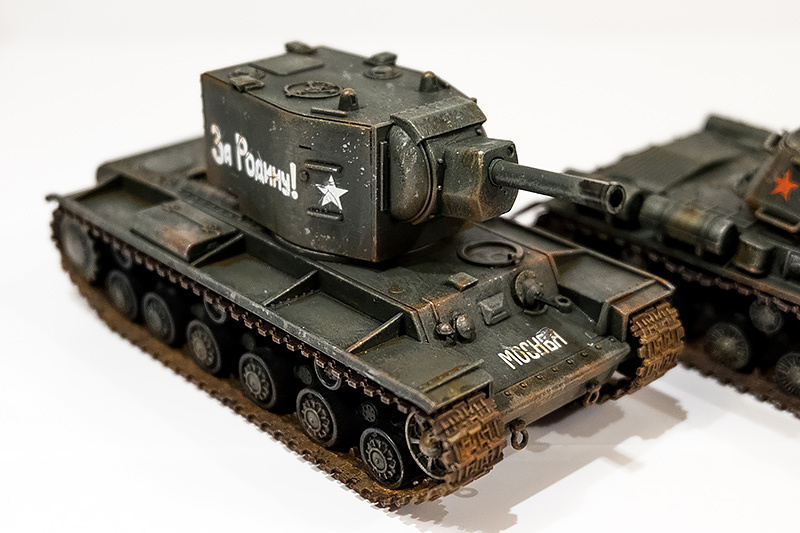 I’ve added some rust and scratches using Vallejo Paint, then I’ve added some rust streaks using a Vallejo light rust wash and finally I’ve added some mud to the tracks using Vallejo pigments which I have fixed with a spray coat of Vallejo pigment fixer. 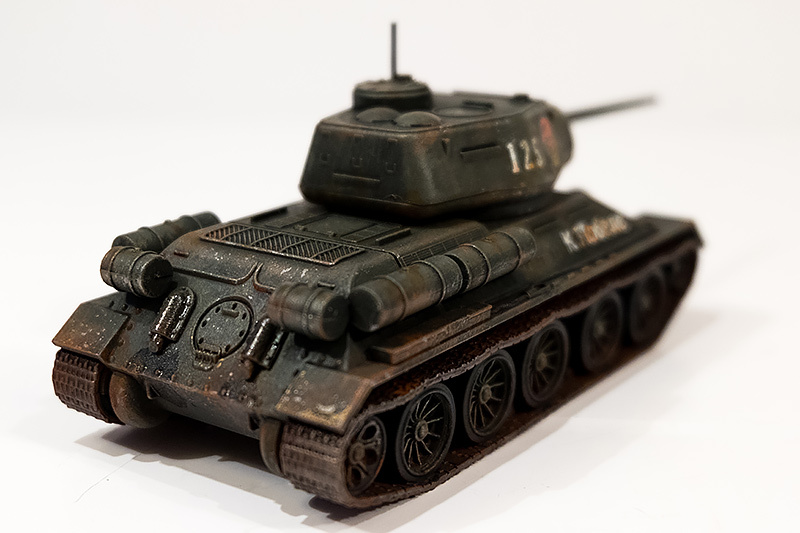 It’s the first time I’ve done scratching and rust on models and also the first time I’ve used the pigment powders. 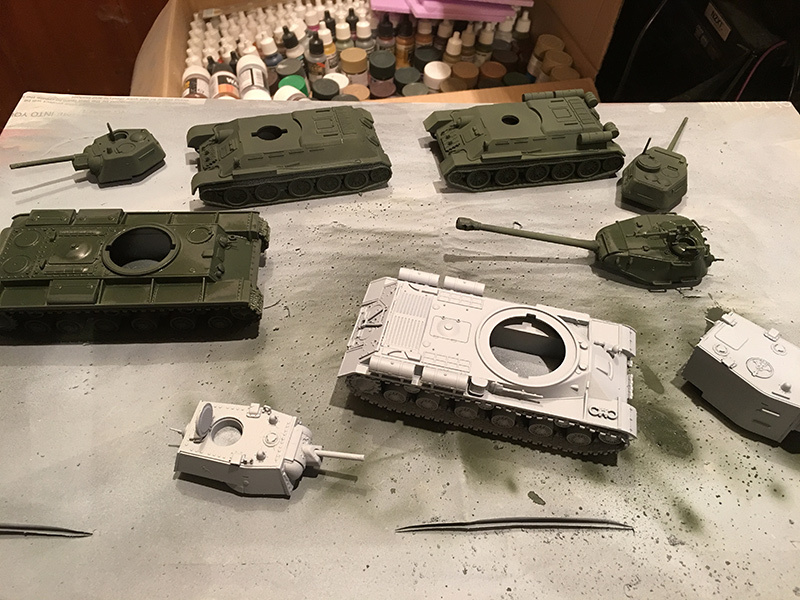 I’m sure I can improve those techniques with practice but I was quite happy with how they turned out. 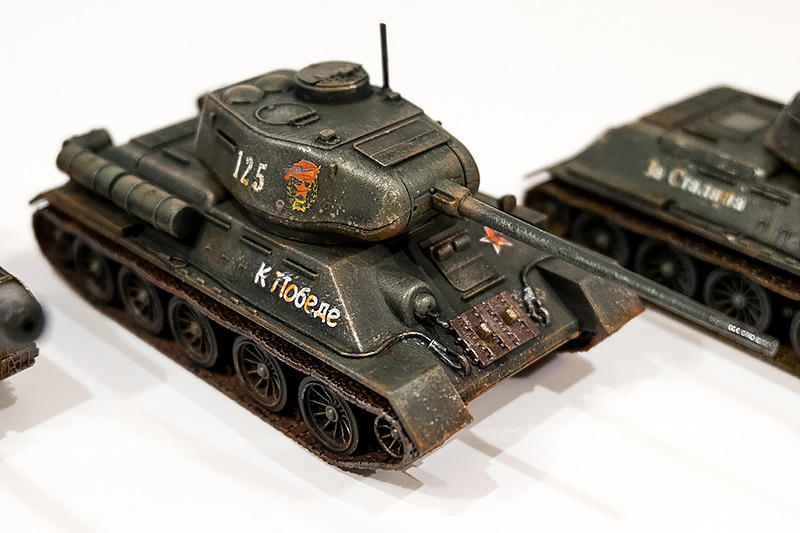 The KV-1/2 kit comes with two separate turrets so you can swap them out and represent either a KV-1 or a KV-2. 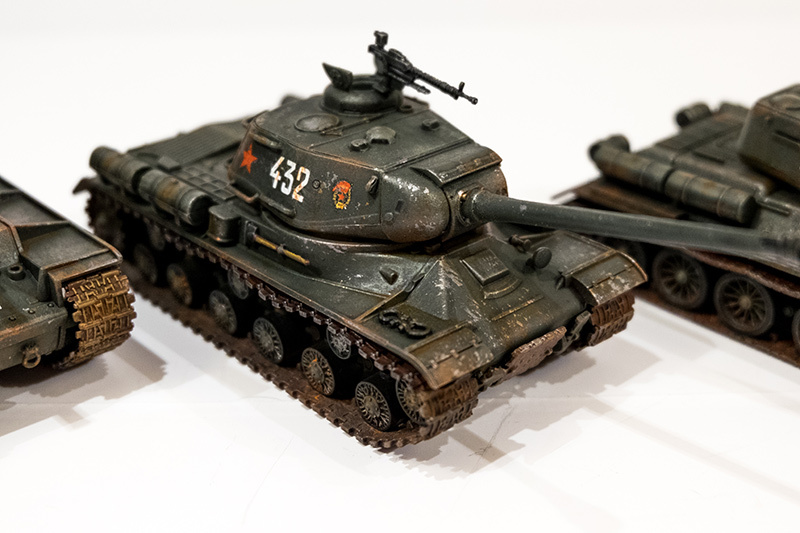 I’ve painted both up so I can use both versions when wargaming.